En route back from the Lake District we stopped off at Birmingham to empty out, fill up and recuperate. We were famished so needing to eat we agreed to drive up to Coventry Road to check out the local offerings. The area is not how I remember from many moons ago - It's dishevelled and way too overcrowded. Businesses are aplenty and everyone seems to be doing well. "There's a spot here and it's one of the best curry houses," said my friend Tee. Who was I to dispute his recommendations. 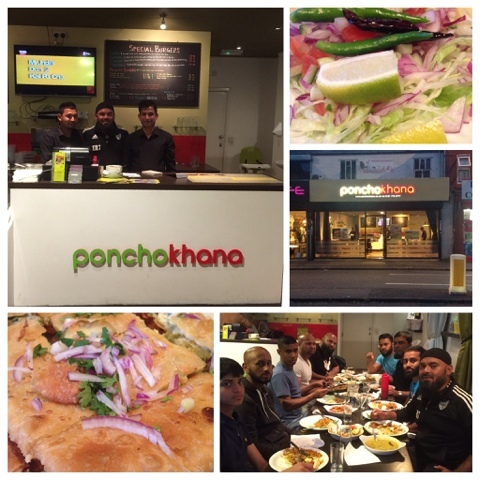 Poncho Khana is situated on Coventry Road. It's sandwiched between a convenience store and a cafe. The neighbourhood is brimming with places to eat but the Bangladeshi cuisine at this joint really does stand out. Amongst the recommended items to try out are the delicious and filling monster burger, daddy burger, bulldozer burger the naga roll, omelette nan starters with a generous dollop of chef's special chilli sauces. The Keema rice is another to add to the list. The food was tantalising, spicy, full of aroma and flavour. The smell from the kitchen will seldom fail to get the mouths watering and the stomach tingling in hungry anticipation. The chef takes his time, the food is cooked with love and served on large plates. The decor is contemporary and the lighting is soothing. I shared a chicken and meat biriani with spicy beef and chicken dishes. The sauce was not too thick - just the way I like it. The spice mixes were just right, the service swiftly excellent. I enjoyed banter with the waiters and they even obliged my request for a photo. My mate Sal said real Brummies steer clear of Coventry Road, but for me it's worth a swift visit to savour local eateries like Poncho Khana. The food is authentic, the service tip top and unlike London you won't be having to bankrupt yourself for a slap up culinary treat. There is also a very good lunch menu for a fiver. From me it's finger licking thumbs up all the way. Poncho Khana, 502 Coventry Road Small Heath B10 0UN Birmingham.